In the spare moments between these projects, the debut Victory Lap album was intermittently written/recorded. The end result is a collection of morose, deadpan pop hooks and occasional guitar freakouts, propped up by disco beats and noodley basslines. Alex is a freelance videographer/filmmaker by trade, working on a broad range of projects from TV commercials to short films. So naturally, being able to whip up a bunch of music videos without too much trouble, every song on the forthcoming album has an accompanying video. 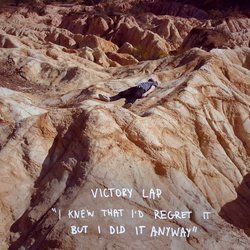 Victory Lap, takes his aloof indie style to new lengths, in endearing and often danceable pop arrangements. ‘I Knew That I’d Regret It But I Did It Anyway’ is the complete epitome of this. Pitting groovy basslines and tropical guitar hooks against deep monotone vocals, this impulsive happy-go-lucky number is the perfect soundtrack to a sunny weekend spent disregarding responsibilities.